In the fraught arena of school reform, few policy proposals have been more contentious than vouchers. In allocating taxpayer dollars to children whose parents want them to leave failing public schools to attend private and parochial institutions, voucher programs have drawn the ire of teachers' unions and church-state separatists, as well as these groups' political allies. Of late, these voucher opponents have had some high-profile successes: In 2006, for instance, the Florida Supreme Court ruled that a key component of the state's Opportunity Scholarship Program was unconstitutional. And in 2009, President Obama and congressional Democrats enacted legislation to kill a voucher program in Washington, D.C., that had helped children escape the district's dismal public-education system and improve their academic performance in private schools. And yet, despite the discord and setbacks, vouchers seem to be experiencing a resurgence. Legislatures across the nation are once again taking up bills to adopt or expand programs that use public dollars to help students pay for private schools. In August, the Associated Press reported that at least 30 states had introduced legislation allowing the use of public funds to support students attending private schools. Twenty-eight states had considered tax breaks for families paying private-school tuition. So far this year, voucher programs in more than a dozen states have either been initiated or significantly expanded. They include Ohio, which expanded its program by quadrupling the cap on voucher recipients, and Oklahoma, which implemented a tax credit for donors to scholarships that fund education at private schools. Indiana launched the nation's broadest private-school voucher program, which provides a voucher to any child in a family of four with income of less than $60,000 a year. This year's new and expanded programs reflect the great variety of voucher initiatives. They differ by the populations of students that they are designed to serve, the generosity of the voucher amount, and the manner in which the money is awarded to parents in order to pay for educational expenditures. Of course, most people associate vouchers with efforts to help low-income children, and indeed, the most common programs subsidize the educations of children from families that fall below a certain income level. For instance, the nation's best-known programs — those in Washington, D.C., and Milwaukee, Wisconsin — are both means-tested. But one of the fastest-growing types of school-choice program does not fit the typical voucher mold. Nor has it received much attention from either side in the voucher debate, as the focus tends to remain on "conventional" voucher programs serving children in low-income homes or in districts with underperforming public schools. It is certainly a mistake, however, to overlook one of the most promising avenues for advancing school choice: voucher programs serving students with disabilities. Far more students are enrolled in special education than the average taxpayer realizes, and many of those students have disabilities so mild that they are not easily distinguished from their "normal" classmates. The pool of students who can be served by special-education voucher programs is thus both wide and deep. And such programs have a proven track record: Special-education vouchers have been around for more than a decade. In fact, they grew at a considerable pace even in the years leading up to the recent renewal of legislative interest in school vouchers. The oldest (and best known) special-education voucher initiative is Florida's McKay Scholarships for Students with Disabilities Program, established in 1999 under the governorship of Jeb Bush. Today, the McKay scholarships constitute one of the nation's largest and fastest-growing school-choice programs, serving more than 22,000 kids in the 2010-11 school year. Indeed, several states have used the McKay approach as a template for special-education vouchers of their own: Similar initiatives are now operating in early stages in Georgia (about 2,000 students), Louisiana (1,600), Oklahoma (6 as a pilot), and Utah (624). This year, Ohio expanded a scholarship program for autistic children to include all special-education students, and North Carolina began offering parents of disabled students a tax credit for private-school tuition (or for special-education expenses in the case of home-schooling families). Several other states have flirted with similar reforms. And some members of Congress have raised the idea of legislation that would allow federal special-education dollars to follow a student into the school of his choice rather than flowing directly into state coffers. Florida's experience with the McKay program demonstrates the enormous potential of special-education voucher programs. Vouchers allow disabled students to attend the schools that best meet their needs. They provide a powerful market mechanism that can help save cash-strapped states millions of dollars. And my own research demonstrates that the incentives inherent in special-education vouchers have helped to improve the quality of education that public schools provide to all of their students. Special-education vouchers are a tested public policy that leads to better education at a lower cost to the taxpayer. Especially in this difficult moment for state finances, they are exactly the sort of education policy that reformers and lawmakers should be embracing. Since 1975, federal law has required that all schools receiving federal funding (virtually all public schools in America) provide equal education to children with physical and mental disabilities. The currently operative law is the Individuals with Disabilities Education Act of 1990, or IDEA, which mandates that all students receive a "free and appropriate" public education, even if they are disabled. In 1976, when these federal policies began, about 8.3% of public-school students were enrolled in special education. Today, that number is 13.2% — meaning that more than one out of every eight children in public school receives special-education services under IDEA. In other words, over the past 35 years, the proportion of public-school students enrolled in special education has increased by a staggering 60%. These numbers may seem impossibly high, in part because most people think of disabled students as children with severe impairments such as Down Syndrome, autism, and other intellectual disabilities. Of course, severely disabled students are in special education; the categories of disabilities covered range up to the very severe, such as Traumatic Brain Injury. But these children are the minority of students served by special-education programs. 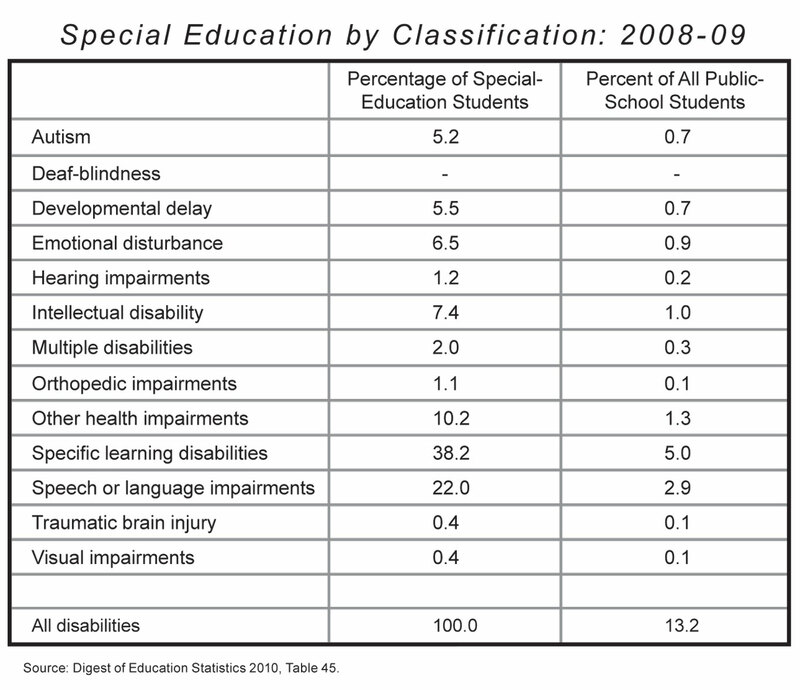 Most kids classified as needing special education suffer from considerably more minor handicaps. By far the largest special-education classification is Specific Learning Disability (SLD), which includes conditions such as perceptual handicaps (mostly difficulty processing sight and sound), developmental aphasia (delayed language acquisition), and dyslexia. SLD accounts for more than one-third of all students in special education, and includes about one out of every 20 public-school students. The next largest special-education category — accounting for 22% of all disabilities (and 2.9% of all public-school students) — is the non-intellectual disorder of Speech and Language Impairments (not counting deaf-blindness, which is its own category). One interesting feature of the expansion of special education over the past few decades is that not all categories have grown uniformly. Over time, the average disability classification has become less severe: The most substantial portion of the growth in special education has come from its mildest category, SLD, which has increased enrollment by 211% since 1976. Meanwhile, the classification of students with some more severe disabilities has grown far less rapidly, and in some cases — such as that of intellectual disabilities — has actually decreased. The reasons for the decline in students with severe disabilities are not known for certain, but it is likely that they include, for instance, the introduction of safer cars (which decrease the likelihood of severe injuries) and the elimination of lead-based paint. The increase in students with mild disabilities is particularly relevant because such students are educated primarily in classrooms shared with non-disabled students. In 2006, 54.8% of SLD students and 84.2% of students with a speech or language impairment spent 80% or more of their time in a general classroom setting (their special-education services were received in short time periods outside of their normal classes). Thus, in many ways, special-education students do not differ meaningfully from non-disabled kids. Also relevant is the fact that, as the percentage of public-school students with disabilities has grown, the issue of special education has become a concern for a broader swath of American families. It is true that males, minorities, and children from lower-income families are more likely to be diagnosed with a disability than are other students. Nevertheless, families of all sorts are affected by disabilities. For instance, 16.4% of the public-school students in the wealthy suburban Chicago school district of New Trier — famous for its high-quality public schools — were enrolled in special-education programs in the 2009-10 school year. That disabilities affect households across the income spectrum has enormous significance for the political and policy potential of special-education voucher programs. Most voucher programs attempted over the past several years have been specifically targeted to lower-income students in poorly performing urban school systems; they have thus been relevant to only a narrow band of the electorate that generally lacks political might. Special-education vouchers, on the other hand, reach a broad spectrum of the population. For instance, of students in Florida's special-education voucher program, 54% are minorities and — reflecting the overall demographics in the state — only 45% have family incomes low enough to qualify for free or reduced-price lunches. Given the growing number of students classified as having disabilities, and their distribution throughout America's classrooms and families, the rapid growth of special education over the past three decades should be of increasing concern to policymakers. To begin, there is the question of whether these rising numbers reflect manipulation of the system or a genuine health problem among school-aged children. Moreover, as a matter of fiscal policy, providing special-education services is quite costly — and the substantial growth in special-education enrollments could strain public-school budgets, pushing enormous costs onto already burdened taxpayers. Clearly, then, the rise of special education, and particularly the factors contributing to it, deserve more attention than they have received to date. Several factors have contributed to the growth in the number of disabled students enrolled in American public schools. Many are linked to real differences in the number of kids with disabilities: Improved medical technology, for instance, has led to an increase in the survival of low-birth-weight babies, some of whom suffer from health problems as children and adults as a result of their underdevelopment in the womb. Still other factors have to do with more accurate classification of disabilities, stemming from improved identification techniques and less stigma attached to having a child classified as "different." Nevertheless, there is reason to believe that factors beyond the incidence and identification of true disabilities have played a substantial role in the growth of special-education enrollments. In particular, it appears that, when determining whether to classify a student as disabled, public schools strategically consider their own financial interests. Students generally do not enter public schools with a disability diagnosis. The process of identifying a student as disabled begins with a referral from a school employee or a parent. The child is then evaluated for the presence of a disability by an expert employed by the school district. If the expert diagnoses the child with a disability, federal law requires that the school district develop a plan for educating him. That plan takes the form of an Individualized Education Program (IEP), which describesthe services that the public school is to provide to the child. If a child manifestly suffers from a severe disability, there is not much his school can do to influence whether he is placed into special education. In the case of mild disabilities, however, there is a meaningful subjective component to diagnosis. In determining whether a child has an SLD, for example, the federal government requires the evaluating expert to assess the child using criteria such as: "[T]he child does not achieve adequately for the child's age or to meet state-approved grade-level standards . . . when provided with learning experiences and instruction appropriate for the child's age or State approved grade-level standards." Clearly, making such determinations is open to a great deal of personal opinion and guesswork; as a result, there is reason to believe that many students who have been diagnosed with mild disabilities are performing poorly academically for other reasons. Indeed, a 2001 study by Donald MacMillan and Gary Siperstein found that, generally speaking, public schools use low achievement alone when diagnosing SLD. Other research shows that many SLD students are indistinguishable from low-achieving regular-enrollment students. Because referring students for testing and classifying them with mild disabilities is so dependent on subjective analysis, the door is open to strategic diagnosis. And public schools have shown themselves willing to take advantage of this opening. They certainly respond to changes in the incentives to diagnose students: For example, recent research finds that schools place additional low-performing students into special-education programs in order to exempt them from state accountability provisions based on high-stakes tests. It thus stands to reason that schools might also alter the rate at which they diagnose students with disabilities in response to underlying financial incentives. And those incentives can be significant. Many states fund special education on a per-child basis; if the amount of money that a school receives for educating a child as a special-education student is greater than the additional cost of providing those services to the student, then the school has a strong financial reason to diagnose the child. The money at stake is considerable. Last year, Florida allocated more than $980 million to school districts in order to fund special-education services for students in the lowest three (of five) severity classifications for disabilities. That comes to about an additional $2,400 per disabled student on top of the base financial allocation to educate the child — an amount that represents the school district's premium for educating the disabled child. A growing body of research suggests that such incentives do influence whether children are classified as disabled. For instance, in a study published in the Journal of Public Economics, University of California professor Julie Berry Cullen estimated that financial incentives accounted for nearly 40% of the growth in student disability rates in Texas during the 1990s. That schools are diagnosing children with disabilities in order to reap financial benefits — rather than to provide those students with the best education possible — is obviously a major problem. Unfortunately, it is just one of many examples of inefficiency and skewed priorities that riddle our current approach to educating special-needs children. It is true that the education of disabled students has come a long way in the past few decades. Before IDEA gave disabled students the legal right to a publicly financed education, they routinely went uneducated by the public schools. Even so, the current special-education system leaves much to be desired. Though many disabled kids obtain a high-quality education from their public schools, some parents of disabled students find that the legal protections guaranteeing their children a right to an education aren't worth much more than the paper they are printed on. How exactly do those protections work? Once a child is classified as having a disability, the school district is required to develop an Individualized Education Program specifying the education services that the public school will provide to him. That IEP is a legally binding agreement between the school district and the child's guardians: If the child's parents believe that the school is not living up to the letter of the IEP, they can challenge the district in court. A judge who sides with the parent might order the school district to increase the services it provides to the child. Sometimes, the court will rule that the public school is not capable of educating the child and will force the district to pay for his tuition at another school — often a private school — that can meet his needs. But as with all legal protections, the disabled student's claim to an appropriate education is only as powerful as his ability to enforce it. Many parents are unfamiliar with the legal process and can't afford legal counsel; they are thus at a disadvantage when suing deep-pocketed school districts and their teams of lawyers. As a result, when school districts challenge orders to pay for a disabled child's education at a private school, they usually win: According to research by Thomas Mayes and Perry Zirkel, school districts in fact triumph in about 63% of such cases. And this figure almost certainly understates the problem, since many unhappy parents don't have the resources to bring lawsuits in the first place, or simply choose not to go through the hassle given the small chance of success and the discomfort that comes from suing the very people who educate their children. Perhaps the biggest disadvantage faced by parents who would sue for private placement is time. Court challenges to a child's IEP can take months and sometimes years to complete. During that time, the child remains in a public school that his parents believe is not meeting his needs. Delay doesn't harm the school district, but it can be detrimental to a growing child. For instance, in the case of one disabled student in California, a judge lambasted the school district for "willfully and vexatiously" dragging out the case for so long that, by the time it was resolved and the judge handed down his decision, the child in question was 23 years old. Such lengthy proceedings make a farce of the protections offered under IDEA. They leave students stuck in schools unable to serve them, and without the resources they need in order to leave. And they highlight the many ways in which the current system for educating disabled students is expensive, legalistic, and often counterproductive. In order to address these problems, several states are beginning to experiment with programs that supplement the legal protections offered to disabled students with a market mechanism allowing them to attend any school that they choose — without the burden of an expensive and time-consuming lawsuit. Their model is Florida's McKay Scholarships for Students with Disabilities Program. Arguably the national leader in education reform, Florida was the first state to develop a voucher program to increase the choices available to disabled students. Under the McKay program, if a parent thinks that a public school is not addressing his disabled child's needs, he can use a voucher to send the child to another public school or a private school. No drawn-out legal proceedings are required. Since its inception, enrollment in the McKay program has grown dramatically. From the time it was first adopted statewide in 2000 through 2010, the number of students using a scholarship has increased from 970 to 20,926. The substantial increase in the number of students using McKay vouchers stems mostly from the increase in the number of private schools willing to accept them — a figure that grew from 100 schools in 2000 to 959 schools in 2010. Moreover, private schools have shown a willingness to enroll voucher students across the spectrum of disabilities: More than half of the students using a McKay voucher to attend a private school have a disability that is in the least severe disability matrix, while about 8% of students using a McKay voucher have disabilities in the two most severe categories — proportions similar to those found among disabled children attending public schools. To participate in the program, private schools must meet safety requirements and must employ teachers with at least a bachelor's degree. Some of the schools specialize in serving students with severe disabilities, but many others are conventional private and parochial schools focused on serving more general populations. About 65% of participating private schools have a religious affiliation. Unlike many other school-voucher programs, McKay does not require private schools to accept the voucher amount as full tuition payment, nor are private schools required to accept all applicants. McKay is also distinguished from other voucher programs by the generosity of the scholarship it provides. An eligible student is given a voucher equivalent to either the total amount that would have been spent on educating him in the public school he is exiting, or the total amount of tuition charged to the student at the accepting private school — whichever is less. Since the cost of providing special-education services varies with disability, there is a wide range in voucher amounts: In 2010, for instance, McKay vouchers ranged from $4,746 to $19,133; the average scholarship amount that year was $7,144. As far as state finances are concerned, this number represents an enormous cost savings: According to the U.S. Department of Education, Florida spent an average of $12,744 to educate a public-school student in 2007-08 (the most recent year for which figures are available). It thus costs the state about 43% less to pay for a disabled student's tuition at a private school that his parents have chosen for him than it does for the state to educate an average student in the public school to which his zip code has assigned him. Unfortunately, largely because students using McKay vouchers to attend private schools are not required to take the state's standardized tests, we currently know very little about the experiences of disabled students who use a voucher to attend a private school. But a survey of parents who are using McKay vouchers — conducted in the early years of the program by researchers at the Manhattan Institute — suggests that parents seeking educational alternatives for their disabled children do not miss the legal protections of IDEA. Only 30.2% of parents surveyed said that their children's previous public schools provided the services legally required by their children's IEPs. Meanwhile, 86% of the parents reported that the private schools in which they had enrolled their children were providing the services they had promised — even though they were not legally required to do so. Despite this promise shown by the McKay program, there are still the inevitable naysayers. Some have concerns particular to the education of disabled students. By and large, however, the critics' objections are the same familiar complaints lodged against vouchers everywhere — complaints that have either by now been mostly discredited, or that simply don't apply in the case of special-needs students. Today, the more common arguments against school-choice policies focus on the effects of these initiatives on students who remain in public schools. To be sure, if special-education voucher programs helped disabled children at the expense of students who stayed in their public schools, we would rightly worry about such policies. Fortunately, however, empirical research indicates that school choice broadly speaking does not harm public-school students. Moreover, the particular nature of special-education vouchers turns the common argument of school-choice opponents on its head. There is a reasonable theoretical case to be made that conventional voucher programs — that is, means-tested programs available to regular-enrollment students — could hurt students who remain in public schools. The most compelling line of this argument is that choice harms public-school students by reducing the quality of the peers with whom they share classrooms. Research shows that peer quality is important to school productivity, though just why this is true is unclear: It may be because high-quality peers influence school quality by serving as good academic and behavioral role models, or because low-performing students are more likely to cause classroom disruptions or attract disproportionate attention from teachers. In any event, it has been established that a student will learn more in a year if he is surrounded by high-performing classmates than he will if he is surrounded by lower-performing classmates. The worrisome aspect of school-choice programs, then, is that they might pull the best and brightest students out of public schools. After all, in order to enroll in a choice program, a child must have parents who are engaged enough to want to identify an educational alternative, active enough to know that the choice program exists, and savvy enough to maneuver through the enrollment process. And having such involved parents correlates strongly with a child's academic achievement. Furthermore, unless the choice program's guidelines prohibit the practice, many suspect that private schools will enroll only voucher students who meet the schools' academic admission criteria — thus opening their doors to high-performing students while keeping out low performers. In these ways, conventional school-choice programs could "cream skim" the nearby public school's brightest students — leaving the lowest performers to share classrooms together, and hence further driving down their academic achievement. But while the argument that choice could harm public schools is a plausible one, it is not borne out by the facts. The past two decades have yielded considerable research on public-school responses to school-choice policies, including vouchers. The findings of a recent review of the existing research by Brian Gill and Kevin Booker are typical: They conclude that there is reason for "cautious optimism" that school-choice programs not only do not harm public schools, but actually tend to improve the quality of the education they provide. While it is true that school choice is not provoking the dramatic turnarounds in public schools that its champions had hoped for, there is no convincing evidence that it has diminished the quality of public schools anywhere it has been tried. Of course, such research probably won't ever stop hardened critics from arguing that vouchers pose a threat to public schools. But special-education vouchers add a new wrinkle to their tired argument: The "cream-skimming" claim used against more conventional school-choice policies simply does not apply in the case of disabled students. Almost by definition, vouchers that are available only to disabled students do not allow private schools to "skim" a public school's highest achievers. Special-education students are usually among the lowest-performing students in a school; most students who have been identified as having a mild disability were tested precisely because they were struggling academically. Thus, unlike more conventional voucher programs that are utilized by regular-enrollment students, special-education vouchers should improve overall peer quality within a school — since some of the lowest-performing students will leave for private schools. And especially because students with mild disabilities usually spend most of the school day sharing classrooms with non-disabled students, this improved peer quality should in turn drive up the academic performance of regular-enrollment students, allowing them to achieve at higher levels than they would have without the voucher program. Beyond the typical anti-voucher crowd, there are those who would oppose McKay-style vouchers because of concerns specific to children with disabilities. In particular, many advocates for disabled students are wary of special-education voucher programs like McKay because private schools are not subject to the legal requirements imposed by IDEA. Yet here, too, the opponents' argument does not stand up to scrutiny. It is true that, under a McKay-style voucher program, a parent cannot sue a private school for failing to correctly administer a child's IEP. But a parent who is unhappy with the services provided by a private school can always move his child to a different private school — or simply return his child to the local public school, which is legally required to follow the provisions of the IEP. Programs like McKay do not undermine the legal protections of the current system: They supplement them by creating a market and empowering parents as consumers, free to walk their children to different schools if they feel they can get better education elsewhere. It should thus be clear that special-education vouchers can boost the academic achievement of both the disabled students who use them and all students who remain in public schools. What has been less obvious — but no less important — is their potential to remedy a great injustice in our current system: public schools' misdiagnosing children as "disabled" in a naked attempt to reap more cash. A fascinating feature of special-education voucher programs is that, unlike means-tested programs, public schools play an important role in determining which students are eligible for vouchers. It stands to reason that if public schools respond to such policies strategically, the use of vouchers will reduce the number of students improperly placed into special education by shrinking the financial incentives to diagnose a child as disabled. In the absence of vouchers, a school will have a financial incentive to diagnose a child as disabled if the cost of providing him with special-education services is outweighed by the additional revenue that the school will receive for providing those services. As discussed above, a growing body of empirical research suggests that schools do in fact respond to such financial incentives by increasing the number of students they diagnose as having disabilities. But special-education vouchers should alter a school's financial calculus. Diagnosing a child as disabled might bring a school additional revenue, but it would also make the child eligible to receive a voucher. If the child were to use the voucher, he would take all of his per-pupil resources — both special-education funding and any base funding — out of the public school. When determining whether to place a marginal student into special education, the school would now have to weigh the premium it would receive if the child stayed enrolled against the likelihood that he would leave for a private school. Vouchers should thus make public schools hesitate before classifying as "disabled" a student who is simply behind. In a recent study, University of Arkansas professor Jay Greene and I put these theories to the test, assessing two important potential effects of the McKay program on Florida's public-school students. First, we measured whether and to what extent competition from the program influenced the academic achievement of students who remained in the public schools. Second, we tested whether competition from the program is related to the probability that a student will be newly identified as having an SLD. Our full study appears in the June issue of the peer-reviewed journal Educational Evaluation and Policy Analysis, published by the American Education Research Association. Essentially, our analysis looked at whether a public school's student achievement and a child's likelihood of being diagnosed with an SLD were related to the number of private schools nearby willing to accept McKay vouchers. This sort of geographical measure is commonly used as a proxy for the competition that a public school faces from a choice program: The idea is that, when a public school is surrounded by many private alternatives, it is more likely to lose students and thus faces greater competitive pressure. When there are few nearby private schools willing to accept vouchers, the public school is essentially unaffected by the choice program in question. The results of our analysis showed that Florida public schools have in fact responded to competition from McKay in a way that benefits students who remain in public schools. We found that, as a public school's exposure to the program increases, a student in that school is less likely to be classified as having an SLD. For a student in a school with average exposure to the McKay program, the likelihood of being diagnosed with an SLD was reduced by about 12%. We also found that regular-enrollment students benefited academically when their public schools faced competition from the McKay program. As the number of private-school competitors surrounding a public school increased, the test scores of students who remained in that public school went up as well. Consistent with prior research on vouchers, the academic effect of the special-education vouchers on students who remained in public schools was relatively mild. But contrary to voucher opponents' usual claim, the choice program certainly did not harm public-school students, and in fact tended to help them. One might argue that these patterns and relationships existed before the McKay program introduced the public schools to outside competition. But in a powerful robustness test, we looked at public-school outcomes in a given school year, and at the number of nearby private schools choosing to accept vouchers in the next school year — a factor unknowable to a public school at the time when it is diagnosing students with SLDs. We found that the number of nearby private schools accepting vouchers in the following academic year was not systematically related to SLD placement, and only minimally related to public-school achievement. In other words, nearby private schools have no influence on these outcomes in public schools until they make themselves available to educate students with vouchers — at which point the outcomes for public-school students change. This is strong evidence that public schools in Florida are responding to the influence of competition for disabled students brought about by the McKay program. Few public policies have as much potential upside as special-education vouchers. These growing programs offer a public-school system's neediest students access to a high-quality education without their having to file lawsuits in order to get it. Both theory and empirical research suggest that these policies benefit students who remain in public schools, while also helping to slow the unnatural, almost certainly erroneous, and potentially damaging increase in the diagnosis of disabilities. Finally — and of greatest relevance to cost-conscious lawmakers — special-education voucher programs provide these benefits while saving vast sums of taxpayer dollars. Florida's McKay program offers a nearly ideal template for policymakers to consider. It is an unusual case of a revolutionary policy that essentially got it right the first time. Before tinkering with the McKay strategy too much, states considering similar reforms should keep in mind some of the program's essential features. First and foremost, a special-education voucher policy must provide generous scholarship amounts. McKay's calculation seems about right: The voucher should be worth the lesser of the private school's tuition or what the public school would have spent to educate the student. Only such substantial vouchers are likely to truly help disabled students find suitable private schools capable of meeting their needs. Another important attribute of McKay that states should retain is the ability of private schools to refuse some applicants while accepting others. Means-tested voucher programs often require private schools to accept all applicants to stop them from enrolling only the public-school system's best students. But, as discussed above, special-education vouchers offer no such potential for "cream-skimming." Further, many private schools that are perfectly willing to accept students with mild disabilities simply do not have the resources necessary to accommodate students with more severe disabilities. Requiring private schools to accept all voucher applicants would dramatically reduce the number of options available to students. The substantial increase in school-voucher programs this year demonstrates that there is renewed interest in helping families send their children to the schools of their choice. As more and more states seek ways to increase options for students, legislatures would do well to give special-education vouchers a serious look. Marcus A. Winters is an assistant professor in the College of Education at the University of Colorado at Colorado Springs and a senior fellow at the Manhattan Institute for Policy Research. This essay was made possible in part by generous support from the Hertog/Simon Fund for Policy Analysis.